The Association of Bi-State Motor Carriers is a non-profit membership group of 170 member firms from trucking and trucking-industry related companies doing business at the Port of New York-New Jersey, representing a majority share of port and container traffic there. Live Gate Cameras are the property of each terminal. These images are provided as a service to our members without our certification for their content or accuracy. We are proud of the solid working relationship we maintain throughout the Port Community, facilitating open communication between the Intermodal Trucking Community and the Port Authority, State Legislators, Shipping Lines, and Terminal Operators. We have achieved this, in part, through our General Membership meetings and targeted Focus Group meetings, where we openly discuss issues that impact our industry, and work together to resolve them. Our goal is to provide an environment where all port stakeholders can work together, cooperatively and collaboratively, for the benefit of all. To provide a forum in which truck operators, owners and businesses in trucking-related industries can share ideas, solve problems, and foster a thriving intermodal transportation business environment. The Association of Bi-State Motor Carriers was incorporated in 2002. It currently represents over 80% of port and container traffic at Port Newark, with more than 170 members from trucking and trucking-industry related companies doing business there. The Association is dedicated to serving the interests of its members in Intermodal Transportation, especially at the Port of New York-New Jersey. This port handles over 80% of the world trade for a 10 state, 260-mile radius area, which represents 34% of the U.S. volume of trade. Our members are located throughout the U.S. and Canada. 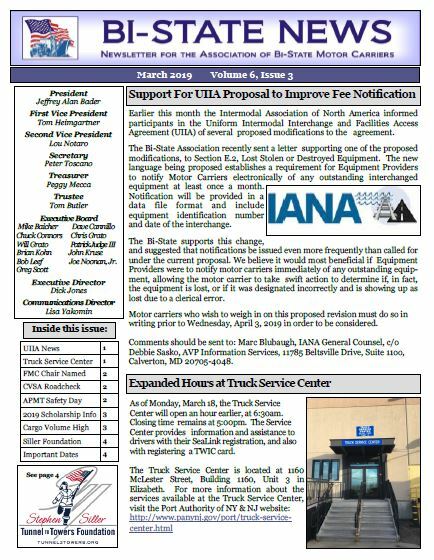 © Association of Bi-State Motor Carriers, Inc.